Microsoft will soon be fixing one of the biggest complaints about its Windows 10 on ARM devices, with the news that the Snapdragon-driven machines will be able to run 64-bit apps in the near future. As we’ve said before, there are notable issues with the new wave of so-called ‘always connected’ PCs – some of which are more obvious than others – and one of the main ones was the fact that these devices can only run 32-bit software, thus limiting the selection of applications available. Microsoft had already said that this picture would change at some point in the future, and according to an Engadget report, Erin Chappie, general manager for Windows, confirmed that an ARM64 SDK will be officially announced at the upcoming Build conference which kicks off on May 7. This SDK will be available for both UWP (Universal Windows Platform) apps as well as traditional desktop apps. However, pushing the kit out is just the first step in the process. Developers themselves will have to recompile their own applications for ARM64 compatibility, of course, and there’s not much Microsoft can do if devs decide it’s not worth the trouble. That said, this is still a big step forward in opening up the number of potential apps which are available to those who have taken the plunge with a Snapdragon notebook, and at least the move is happening sooner rather than later. 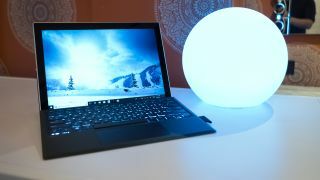 The big selling point of these laptops like the HP Envy x2 is their extensive battery life (20 hours) and built-in LTE connectivity thanks to the Qualcomm chip inside. However, there are question marks over the sort of performance you’ll see from 64-bit apps, and concerns about the power available from the Snapdragon 835 which powers the first wave of notebooks. That chip has already been criticized in some quarters when it comes to how it performs when running emulated desktop x86 apps, and there are arguments that these always connected PCs will need to step up to a more powerful processor in order to deliver truly solid levels of performance.